Custom Plumbing traces its roots back to 2001 in Arizona. With thousands of successful projects under our belt, we can proudly say that we are one of the most trusted Plumbing companies in the Western United States performing both commercial and residential work. For more than 18 years, we have offered a wide range of Plumbing services in Arizona. We strive to maintain the highest standards while exceeding client’s expectations at all levels. We not only honor commitments, but are known for meeting tough deadlines while delivering nothing but the best. We aim to create a responsive client relationship that allows us to meet and even exceed the goals of each of our projects. Custom Plumbing is well known for its innovation and by collaborating successfully with our customers, designers, sub-contractors, consultants as well as suppliers; we have been able to provide more specialized level of services. We are continuously evolving and understand the different aspects of delivering high value work. Call us now…our plumbers are standing by! I was born in Cincinnati, and was raised in Kentucky and California. While in California, I attended San Diego State University and graduated with a BA in speech communications in 1996. My first real job out of college was for Nextel communications where I was in sales then later a sales manager for MCI Direct. I’ve been working hard the majority of my life (since 14 to help my mother pay the bills). For a long time, I worked within the food and beverage industry, where I was eventually promoted to the Food and Beverage Manager for Mammoth Mountain Ski Area. After 20 years in the food and beverage scene, I took a chance with an entirely new industry (Plumbing and HVAC) and never looked back – it was a great move. With much success growing a company from a 500K a year business to a 15 million dollar a year division, I decided to work for myself instead of others. I wholeheartedly believe that if you treat a customer like family, and do quality work at a fair price, you’ll never go wrong! These are the values that keep me going forward, and this is why I have been able to grow into what I am today. When I’m not with my Custom Plumbing family I enjoy classic bodybuilding. I have had the good fortune of becoming an IFBB Pro and becoming a prep and posing coach. I have met some amazing people and have had some exciting experiences in competitions around the country. 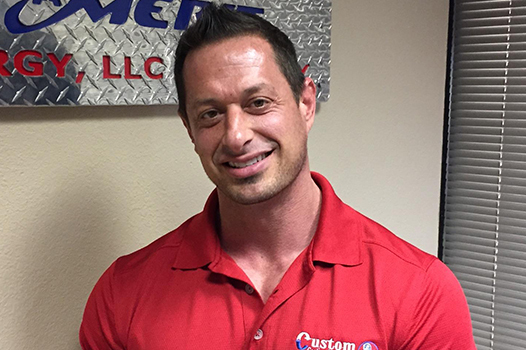 I think the discipline and focus it takes to become a professional bodybuilder has really helped me to lead Custom Plumbing to being the most respected plumbing company in Arizona.